A Separate Reality is the second book in a series Carlos Castaneda wrote documenting his experience as an apprentice to an Indian Shaman or “Man of Knowledge” in the 1960s. A Man of Knowledge, also known as a Sorcerer, a Warrior, or a Seer has access to another world outside of our “ordinary” world. Once he experiences this “other” world, the ordinary world no longer holds any meaning or importance. The Shaman he trained under, an old Yaqui man that Castaneda met in Mexico and calls don Juan, helps him attain access to this other world….by smoking some funny stuff. It’s hard to summarize this book because it is so mystical and out there. If I told you what I read it would just sound ridiculous. Carlos travels to Mexico to visit don Juan several times a year. He longs to know more and more about don Juan’s way of life, the plants he smokes and the experience of “seeing” in this other reality. Don Juan takes Carlos under his wing and shows him the ropes. Over time, it all becomes too much for Carlos and he leaves the apprenticeship for seven or eight years. But, curiosity gets the best of him, and he returns for a more in depth study. Overall, this was a very pleasant and easy read. It got a little monotonous over time though because it seemed like he was just doing the same thing over and over. The routine went like this; ask don Juan a question, smoke his peyote or some other plant, be set in a certain pose by don Juan, hallucinate, get scared, go to the creek to get washed off, go home, nap, and talk about it the next day. Now, that is over simplified and I don’t mean to imply there was no meaning for him, but that was pretty much the routine. You know what I think? I think that if you smoke hallucinogenic drugs, you hallucinate. You “see” and “experience” weird things. (so I’ve heard). I actually know someone who was a student or follower of Castaneda’s teachings way back long ago. He understands way more about this book than I do. He smoked the funny stuff and he knew a lot more of the full picture and history behind the teachings than I could ever get just reading book #2. And I was only reading it to mark it off my list, not to particularly learn anything. My friend shakes his head now and warns against anyone getting involved with the stuff. Thankfully, I can find good in a story even when I can’t relate. One thing I enjoyed about this one was how emotionally attached Carlos was to his teacher. Carlos could be a little whiney at times and don Juan could be sassy and impatient, but he thought a lot of his student and he was really pulling for him. This passage from the last paragraph sort of broke my heart. And that was surprising…and sweet. “You indulge too much,” he said softly. 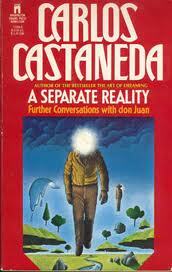 Carlos Castaneda died in 1998. You can Google him and read all kinds of stuff. A lot of it is not flattering but he definitely had a following back in the day. I read this one as part of the LOST Book Club list. It appears in the season 5 episode titled “He’s Our You”, an episode where psychedelic drugs also make an appearance. How bout that?